The every popular DJ Swank Cat is bring the Summer of Swank to Sunday night. Sunday, July 26, 2009 – 9pm – Lebowski Bash2009 – Arsenal’s Tribute to The Big Lebowski. 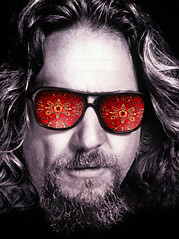 Lebowski tunes and bowling prize giveaways! The Trib recently profiled DJ Swank Cat – this is my favorite question and answer from the article. Q: What is one of the weirdest things that has happened while performing? A: Printable? Hmm … because of technology, I’ll play a song and everyone will get out their cell phones, whether it’s an iPhone or one of the other phones that can interpret what the song is and then tell them what the song is. So it’s funny. I’ll be playing and all of a sudden all these hands will come up holding these glowing phones trying to figure out what the song is. And more often than not, it won’t show up on the phones, which is great.